This excellent SBS genealogy series returns for a second season, featuring another six Australian celebrities in search of their family histories and ancestral roots. The current season features football legend Ron Barassi, actress Sigrid Thorton, actor Ben Menelsohn, singer Christine Anu, celebrity chef Maggie Beer and folk musician John Butler. 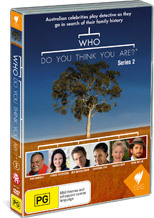 Each of the well-known Australians is given their own one-hour episode, which features them seeking answers from relatives, examining old photos and documents and making significant and often emotional personal journeys in the process. If this all seems a little dry, rest assured it’s more interesting than it sounds. The series has been deftly edited and features some moments of real poignancy, such as when Barassi learns the details of his father’s death in World War II, or when John Butler sits and reads the journal of the grandfather he never had a chance to know. An intriguing glimpse into the individual search for identity, and of what it means to be Australian, this is a novel and compelling series that will engender an appreciation of one’s own roots, and may just make you want to begin charting your own ancestral voyage as well.